Annuals or biennials; usually sparsely to densely hirsute proximally, rarely glabrous throughout. 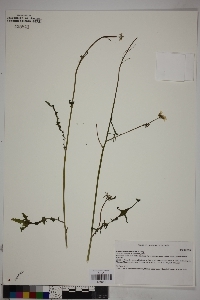 Stems erect, unbranched or branched basally, branched distally, 2-8 dm. Basal leaves: petiole (1-)2-6(-8) cm; blade spatulate to obovate in outline, lyrate, pinnatifid, or bipinnately lobed, (2-)4-20(-25) cm × 30-80 mm, surfaces glabrous or hirsute. Cauline leaves shortly petiolate or sessile; blade base not auriculate, similar to basal, smaller distally. Racemes lax or dense. Fruiting pedicels divaricate-ascending, 5-15(-20) mm, glabrous or pubescent. Flowers: sepals (2.5-)3.5-4.5(-5) × 1.5-2 mm; petals white to purplish, spatulate, 6-9(-11) × 2.5-3.5(-4.5) mm, claw 2.5-4(-5) mm, margins pinnatifid, 5-7(-11)-lobed, papillate basally; filaments papillate basally, median pairs 3-5 mm, lateral pair 2.5-4 mm; anthers oblong, 0.7-1 mm. Fruits linear, (straight or arcuate), 2-6 cm × 0.5-1.2 mm; ovules 60-110 per ovary; style 0.1-0.7(-1) mm. Seeds 0.6-0.8 × 0.4-0.6 mm, not winged. 2n = 24. Flowering Jan-May. Ledges, shade of boulders and cliffs, foothills, canyons, scrub woodlands, streambeds, rocky basalt, crevices; 800-1900 m; Ariz., N.Mex., Tex. ; Mexico (Chihuahua, Sinaloa, Sonora). Dryopetalon runcinatum is easily distinguished from other mustards in the flora area by having divided petals. In the United States, it is restricted to Cochise, Pima, Pinal, and Santa Cruz counties in Arizona, Catron, Dona Ana, Hidalgo, and Luna counties in New Mexico, and El Paso County in Texas. Duration: Perennial Nativity: Native Lifeform: Forb/Herb General: Annual, perennial, or biennial, hirsute throughout, increasing basally, stems erect, branching throughout. Leaves: Pinnatifid, lyrate, or lobed, segments broad, coarsely toothed, occasionally glabrous but generally hirsute, cauline leaves somewhat smaller than the basal leaves, sessile or borne on short petioles. Flowers: White to purple, borne in terminal clusters, petals spatulate with pinnatifid margins, sepals with white margins, strongly gibbous at the base, anthers oblong. Fruits: Thin and linear, to 6 cm, ovules many (to 110) per ovary. Ecology: Found in shady areas, on rocky soils, in foothills, canyons, stream beds, and scrub woodlands; 2,500-6,500 ft (762-1981 m); flowers January-May. Distribution: se AZ, sw NM; south to n MEX. Notes: Distinguished by being an erect annual, 20-80 cm, persisting as a distinct hairy basal rosette with pinnately-lobed leaves, the lobes with broad teeth; stem leaves the same and becoming reduced upward and long, linear fruits. Especially distinct from other mustards are the lobed white petals. Ethnobotany: Unknown Synonyms: Coelphragmus umbrosus, Dryopetalon runcinatum var. laxiflorum, Dryopetalon runcinatum var. 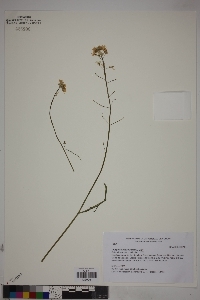 runcinatum, Sisymbrium umbrosum Editor: LCrumbacher 2011, FSCoburn 2015 Etymology: Dryopetalon likes stems from the Greek words drys, "oak," and from the Greek petalon, "petal."